One of the biggest challenges I experience as a food allergy mom is letting my young children eat baked goods. As you may have already know, we are wheat, dairy, egg, soy, nut and peanut free. Wait! Did I just write the basic ingredients for baking and told you that we can’t have any? Since I don’t like my kids to feel left out especially when they are invited to birthday parties, I decided to devote a big deal of my time creating recipes that will satisfy that sweet craving. One of my favorites, if you haven’t notice by now are mini donuts. I like these little treats because kids find it fancy. Grown ups like it for portion control. (Yeah right?) For me, it’s a matter of portability. I even started bringing these to family gatherings and luckily, they are well accepted. 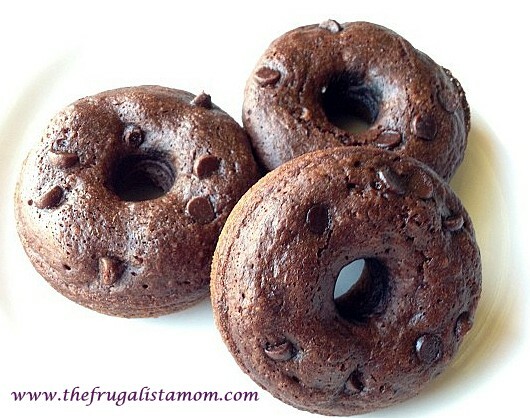 Two weeks ago, I brought these double chocolate chip donuts to my niece’s birthday party. These light and flavorful little desserts became an instant hit. The non gluten free eaters didn’t even care what’s in it. All they say is that it’s really good as they keep on popping one after another. Who says those who have food restrictions eat boring and tasteless food? 1. Make flax goo but combining the flax meal and water in a small bowl. Set aside for at least 5 minutes before using. 2. Preheat your electric donut maker. 3. In a big bowl, whisk together the cocoa powder, oat flour, rice flour, potato starch and baking powder until well blended. Set aside. 4. Make “buttermilk” but adding the vinegar to the non dairy milk. Let it stand for 3 minutes. Don’t worry if it starts to curdle a bit. 5. In another big bowl, cream the oil, sugar and flax goo. Use can use either a stand mixer or handheld electric mixer for this. If you don’t have either, you can just whisk it by hand until it is well blended and light in color. 6. While mixer is running on low, alternately add the flour mixture and non dairy buttermilk to the oil and sugar mix. Start and end with the dry ingredients. 7. Fold in the chocolate chips. Make sure you don’t over mix the batter. 8. Let the batter stand for 5-8 minutes. 9. Pour about 2 tablespoons of the batter on each donut cavity. Top with a few pieces of chocolate chips. 10. Bake for 6-7 minutes. 11. Transfer on a wire rack to cool before serving. Boring and tasteless? Heck no! We eat better-tasting, more nutritious food than folks who buy everything in packages. And we know all the good tricks to sneaking vegetables in where they "don't belong." Thanks for the support. 🙂 It was really tough at first but now we are used to the new lifestyle. A reason why I keep this blog is share our experiences. I was surprised that there were so many who are in the same boat as we are.